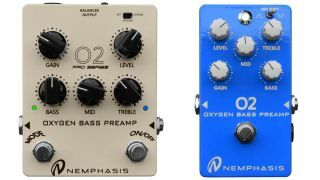 Officially announced at NAMM and now available to buy, Nemphasis's new O2 Oxygen bass preamp pedals promise to fulfil pro bassist's requirements on stage and in the studio. The larger Pro Series O2 packs a three-band EQ section with mode footswitch, which lifts the pedal's EQ and volume for solos and highlighting noteworthy runs. Elsewhere, a gain control and input level cater for passive and active basses, while a ground lift switch gets rid of an earth loops - an XLR output delivers a balanced DI out, too. The regular O2 offers the same functionality as its bigger brother, but does away with the DI out and switchable modes while adding a toggle switch for preset mid boost or cut; in addition, an internal bass boost adjustment offers extra low-end. The Pro Series O2 Oxygen Bass Preamp and O2 Oxygen Bass Preamp can be powered by standard 9V power supplies and are available now for £189 and £149 respectively.